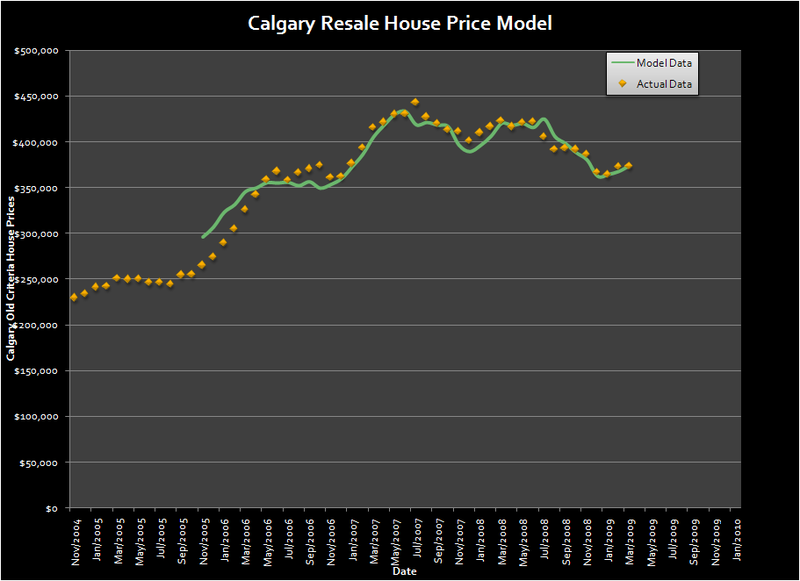 Calgary Real Estate Market Blog | Quantitative analysis of the Calgary real estate market. Posted by DustinRJay in carrying costs, mortgages. In my previous post, I had a poll that asked what the biggest perceived supply risk to the real estate industry in Calgary over the next three year horizon. This was a randomized poll, meaning that the order changed each time. Well, the results are in and an overwhelming majority selected interest rates rising as the biggest supply risk! Why is this a risk? Well interest rates can pull demand forward or push demand backward, but perhaps the biggest impact it will have is on affordability and investor appetite. What does this mean? Well if one has a mortgage, and in 5 years the rate is higher and is beyond what you can spend on shelter that means you will be forced into bankrutpcy. If you are a real estate investor, and your investment depends on leverage, then you may be forced into selling as well if your rent does not cover your increased mortgage costs. This would cause an increase in new listings, and decrease in sales simultaneously shifting the supply/demand curve for housing. 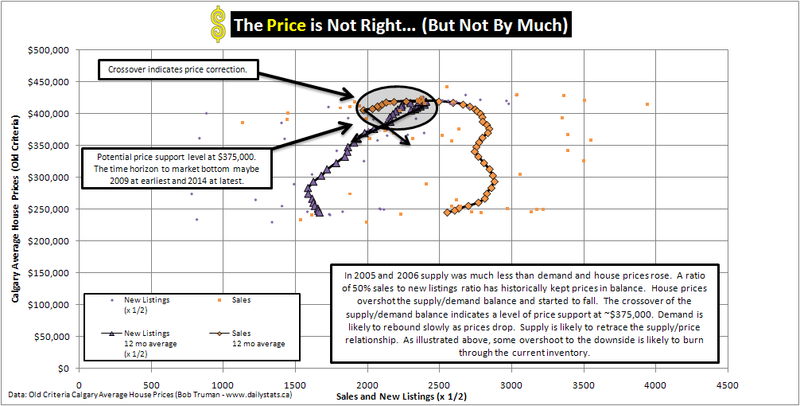 If this point of equilibrium shifts too much, then it could tip the real estate market back into falling prices. That being said, it’s not clear that this is a reason for a sharp bust either. Why? Well, modest increases in wages of 2% annually over 5 years, and that the loan amount will be reduced due to the principal that is repaid, and that mortgage rates will likely increase only 3%, equals that the majority of home owners who do so today with an understanding of the risks involved and borrow with prudence will likely not end up in arrears. Buyers who do not understand that mortgage rates are likely to rise risk defaulting when their mortgage is up for renewal. 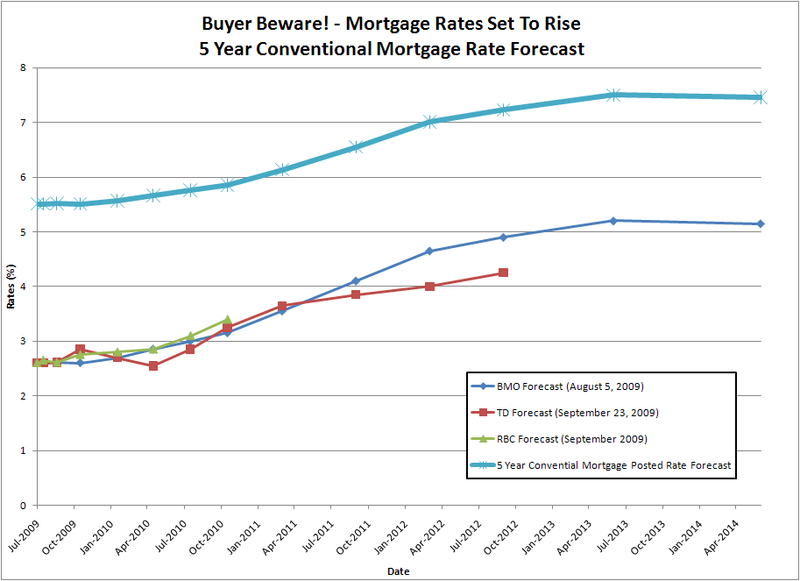 The following graph shows a forecast for the 5 year conventional mortgage rates over the next 5 years. The estimated mortgage rate is derived from the historical risk spread relationship over 5 year Government of Canada bond yields. 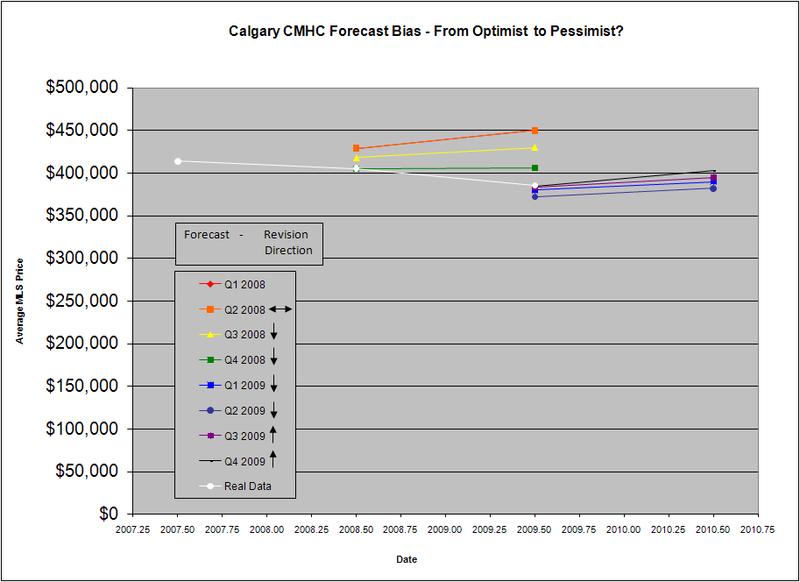 Note that this forecast is based on BMO’s August 5, 2009 rate forecast. 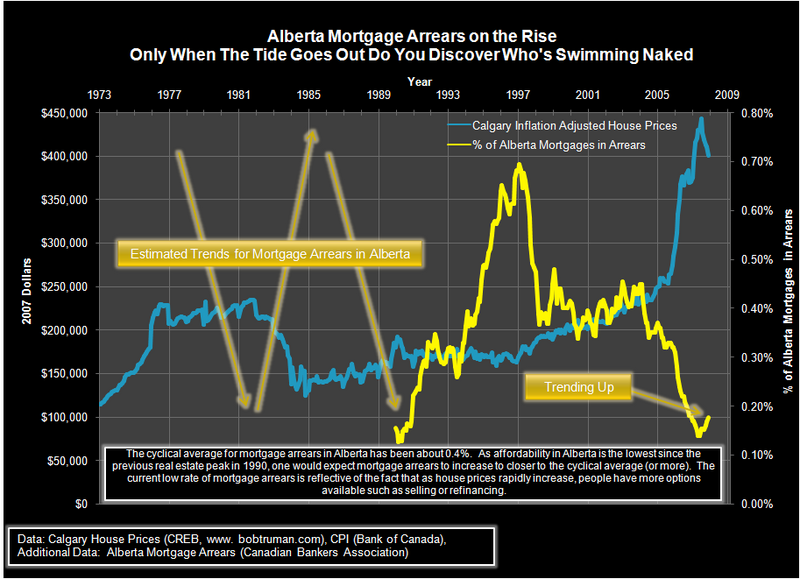 For more information about the historical relationship between 5 year mortgage rates and 5 year GoC bond yields, one can view this graph, courtesy of Kevin on the Edmonton Housing Bust Blog. 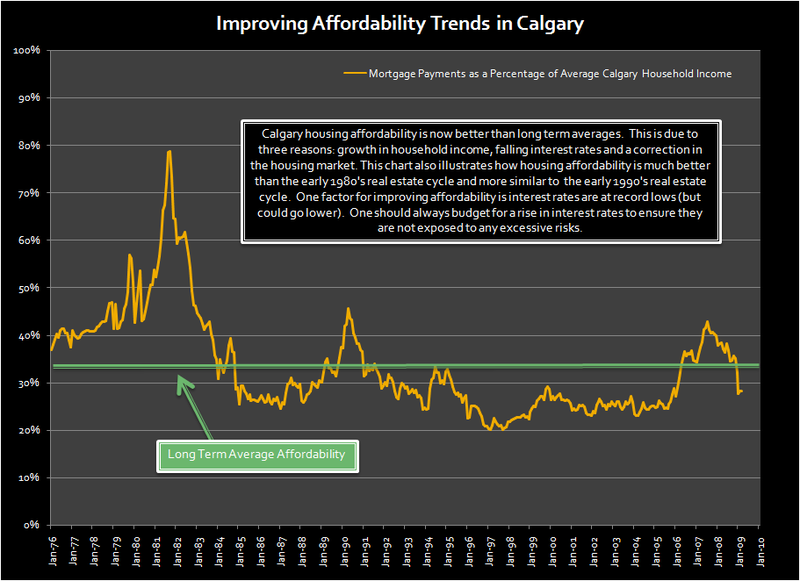 Posted by DustinRJay in Calgary real estate, short term real estate trends, Uncategorized. 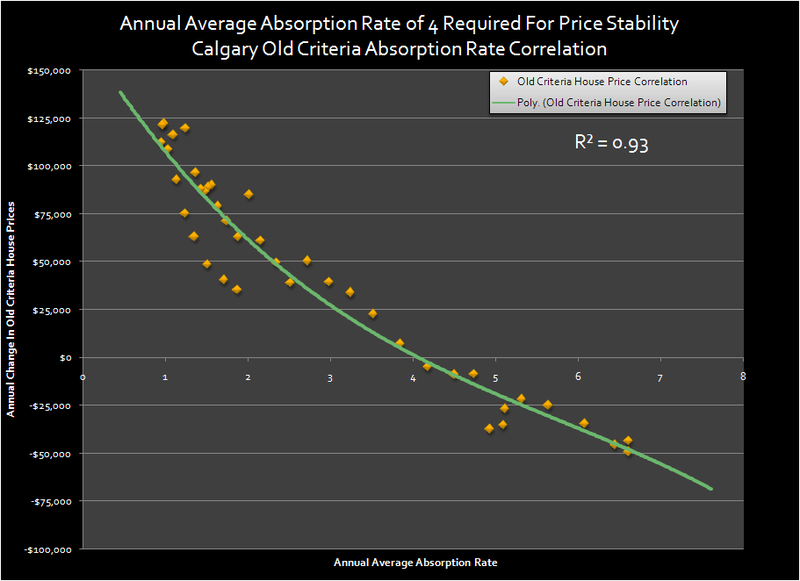 The following graphs illustrate the historical relationship between absorption rate and house price changes in Calgary. 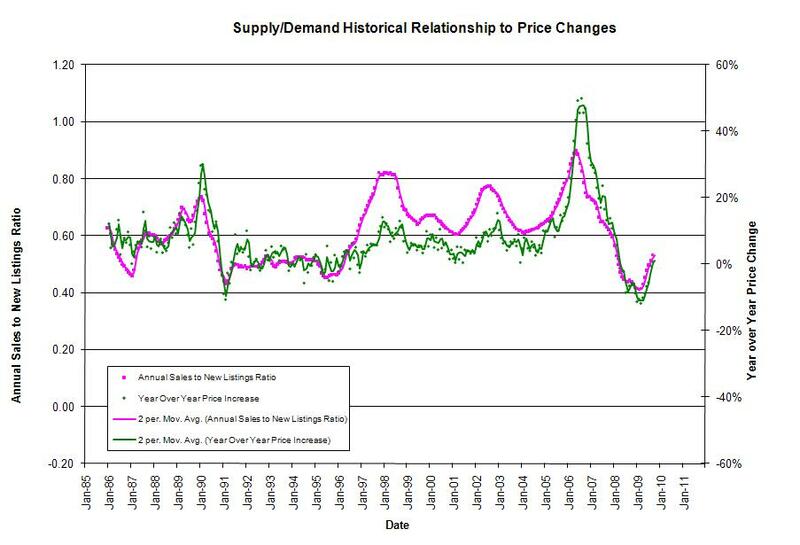 As the absorption rate decreases, demand exceeds supply, and house prices rise. 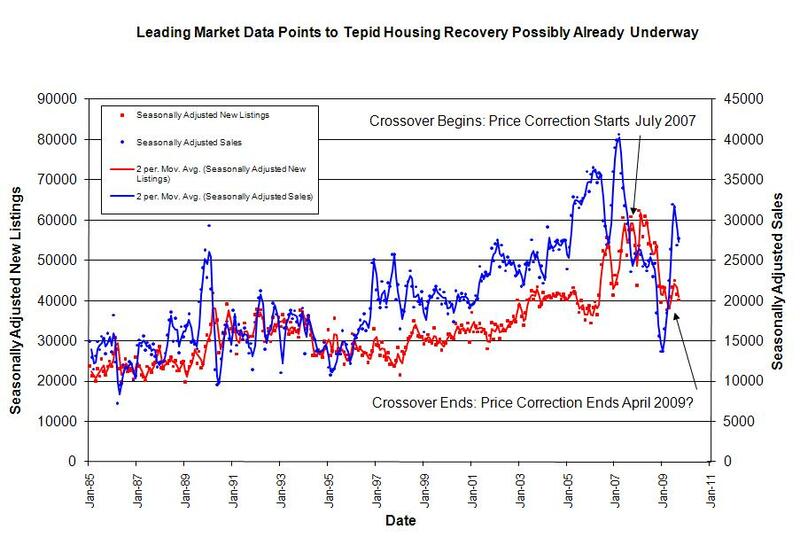 When the absorption rate is high, supply exceeds demand and house prices fall. 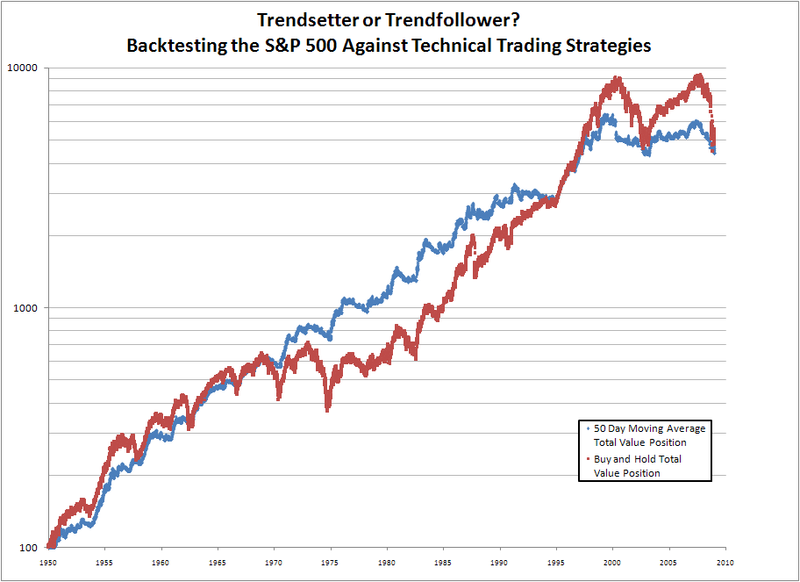 While I do not believe this metric is useful for determining long term price point, I do think it is useful for determing the near term price trends. Recent history indicates that an annual absorption rate of 4 would be a market that is roughly balanced. 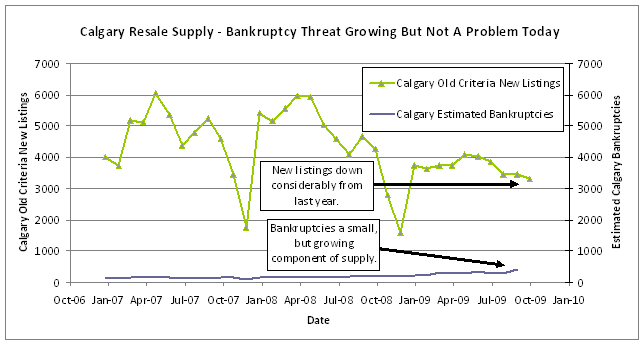 In 2008, Calgary had record amounts of resale inventory and these inventory levels have dropped in 2009. Also, sales dropped dramatically following the credit spread crisis, but have since improved on a seasonally adjusted basis. 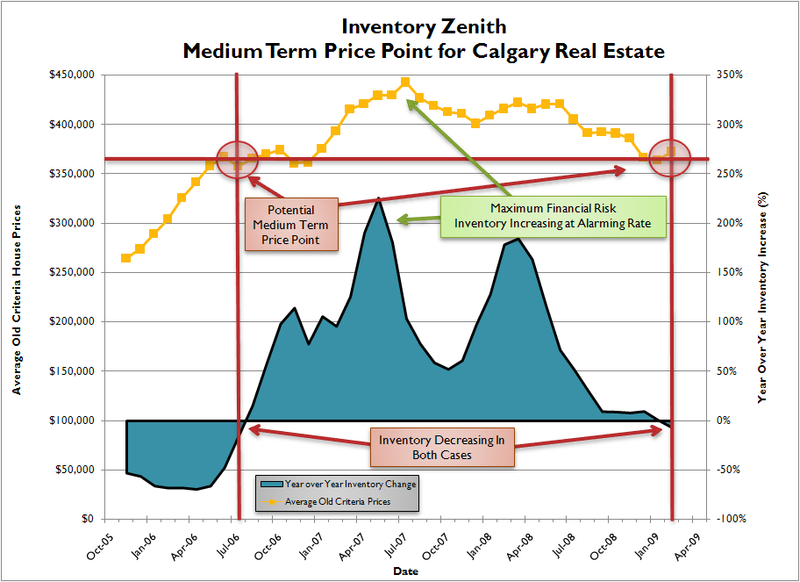 If the current inventory glut continues to decline at it’s current annual rate, and sales stay flat seasonally adjusted, it is possible that the Calgary housing market will bottom in December 2009 after falling further in autumn. I think there are upside risks and downside risks to this forecast. I believe it is prudent for all market participants to err on the side of caution both when formulating business plans and household budgeting. It’s probably also worth noting that house prices are likely to increase by only in the zero to very small single digits for a number of years after bottoming, so there is no rush even if you are trying to time the bottom. 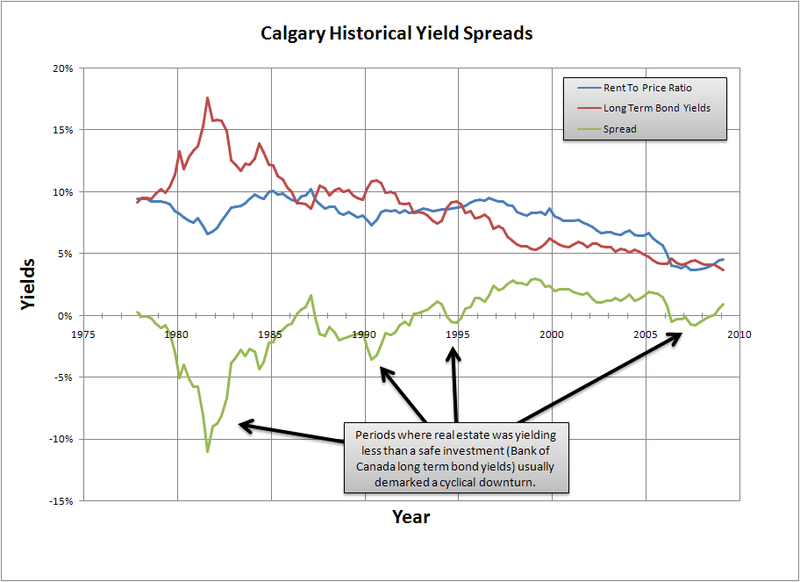 Posted by DustinRJay in Calgary real estate, rental yields, risk spreads, valuation models. One way of evaluating assets is to compare them to a safe investment. Arguably, the safest investment in Canada is Government of Canada bonds. The biggest risk with holding a bond, is that it is subject to inflation over the term that you hold the bond, but virtually guarantees return of your capital. 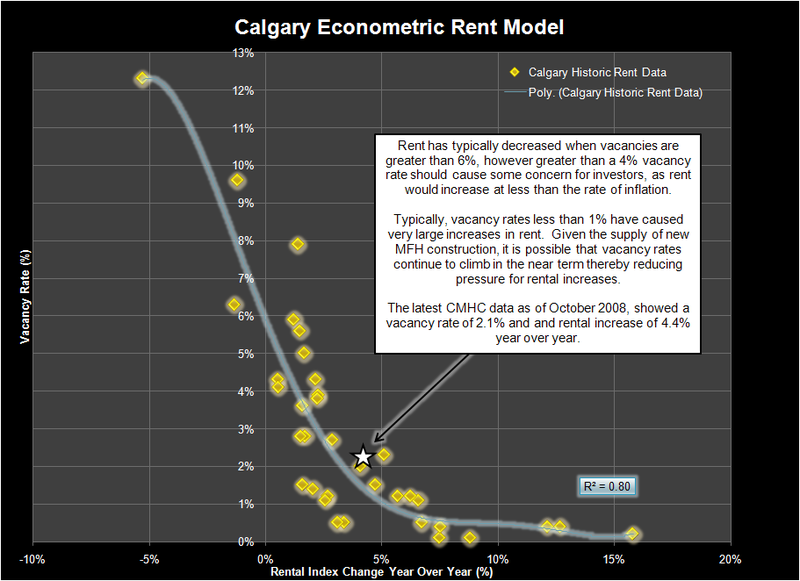 The following graph compares the historical rent to price ratio for Calgary against historical long term bond yields. One of the benefits of real estate over bonds, is that the dividend (rent) can be expected to grow over time, and the asset value will appreciate over long periods of time. A bond does not offer any upside from the coupon rate. Therefore, it’s usually irrational that real estate, which has more risks in comparison to Government bonds should yield less. 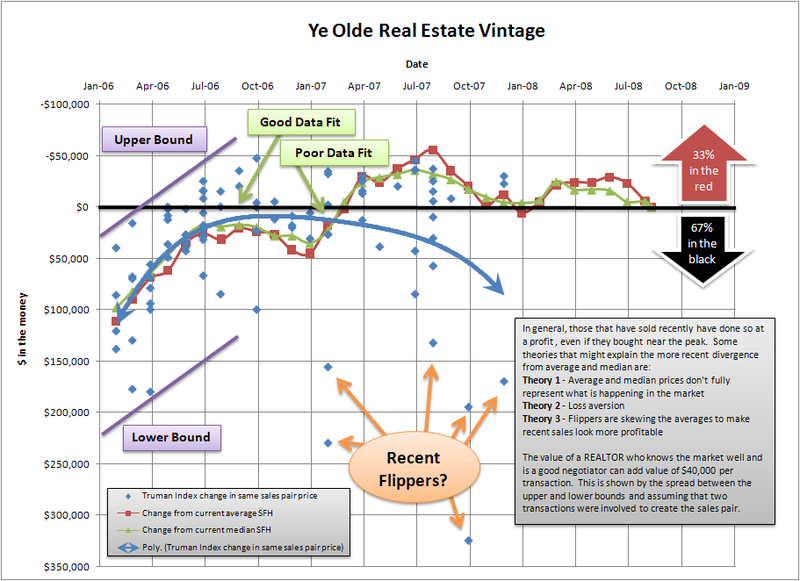 The following graph helps identify some of the recent price corrections including the 1982, 1991 and 2007 corrections. One interpretation is that given recent rental increases, lower bond yields, and lower house prices that the current rent to price ratio is more competitive than bonds, and therefore offers fair value. 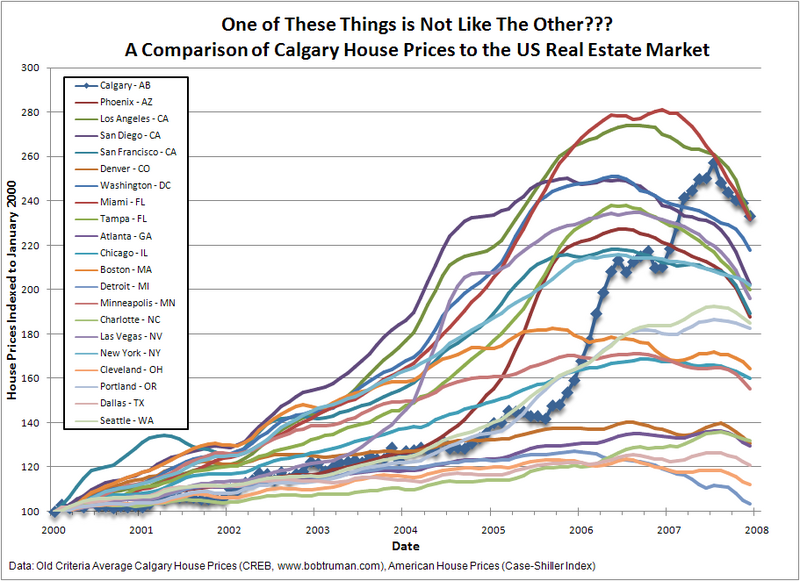 Posted by DustinRJay in Calgary real estate, valuation models. I hope you find this budget useful as I believe having a well laid out plan is extremely important. Having a solid budget in place will create long term value for investors and create a successful financial environment for your family. I strongly encourage people to come up with their own budgets, and perform due diligence before making any investment decision. The following graph shows the average house prices from 1973 to current. 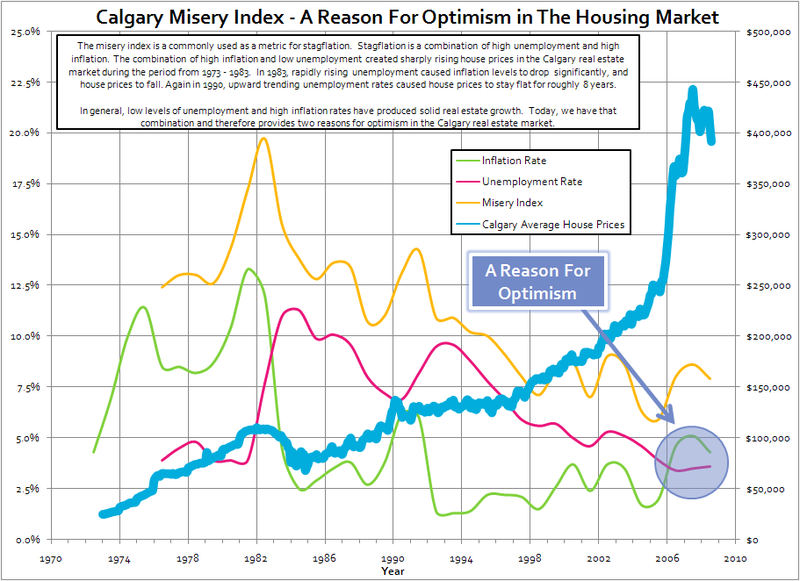 For most of the graphs on this blog it has shown Calgary real estate from an inflation adjusted perspective. If one was to consider inflation however, it can be seen that buying real estate can be helpful as a hedge against inflation. There are better times to buy than others, however I believe that for the average person that bought at the peak in 1983 or 1990 with a 25 year horizon that they are still probably very happy with their decision. Bob Truman, at First Place Realty, is one of the sole providers of real estate information and statistics in Calgary besides the CREB. I use a lot of Bob’s data in my graphs, so he deserves a big shout-out for making this information available to the public! He recently posted the Truman Index for same sales pairs in Calgary. 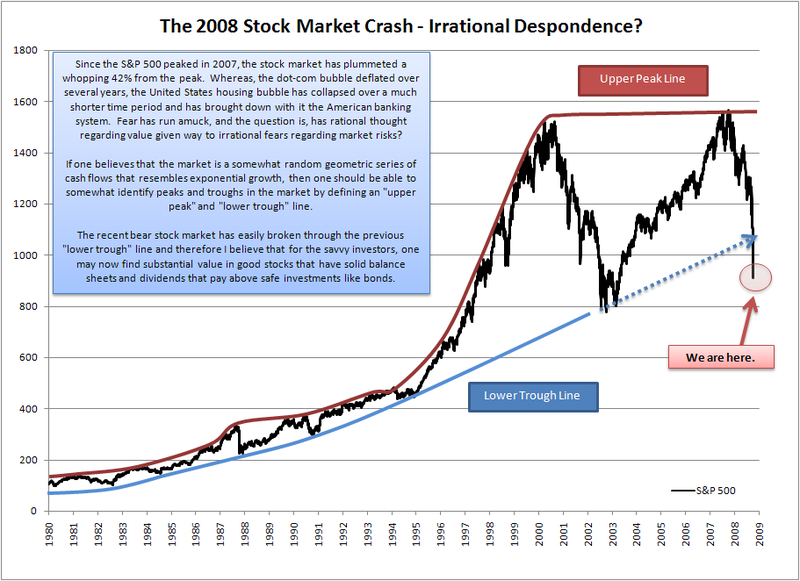 This is similar to the Case-Shiller Index which uses the repeat sales technique to evaluate the housing market. Truman index seems to fit well with older vintage SFH average and median data but poorly with more recent sales. This may be due to changes in real estate market mix, recent profitable flippers skewing the trend or loss aversion. The majority of sales in 2006 and 2007 are still “in the black” as a total of 67% were resold at or greater than the previous sale price. I apologize in advance for the “busy” graph. Posted by DustinRJay in Calgary real estate, commute. I perceive a lot of value in living in downtown Calgary. I love the quick access to Flames games at the Saddledome, downtown nightlife, shopping on 17th Avenue, and jogging along the river pathways. Since recently moving, I have found myself walking to work and my vehicle has sat parked, except for weekend hikes. My commute time is much shorter and my transportation costs have dropped dramatically. For those that are considering living in the inner city vs. the suburbs I came up with an estimate of the value placed on living in close proximity to your workplace. The value I place simply on living close to work over the course of 25 years is about $250,000 at a discount rate of 7%. Also, it would result in having an extra 163 days of life not stuck in traffic over 25 years. Furthermore, over the span of 25 years, my carbon footprint would be reduced by 76,700 kgs. ¡Qué bueno! By doing this exercise I also found that fuel costs are relatively small in comparison to the other costs associated with owning a vehicle. I believe that fuel costs are still much too small to encourage large fuel-efficiency improvements. 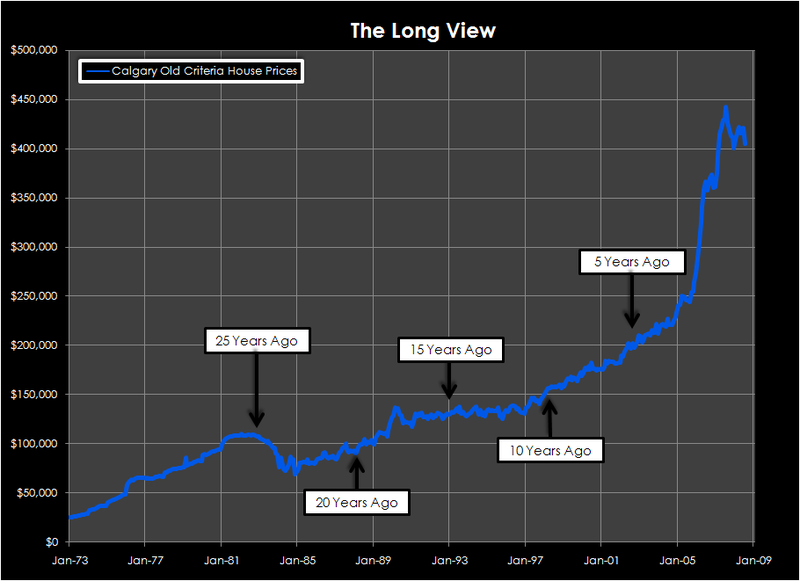 Posted by DustinRJay in Calgary real estate, stock market. 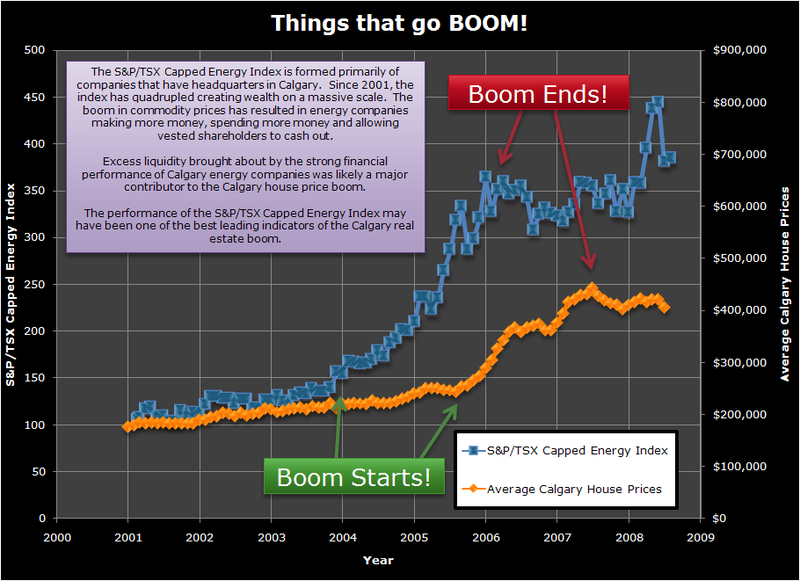 The S&P/TSX Capped Energy Index is formed primarily of companies that have headquarters in Calgary. Since 2001, the index has quadrupled creating wealth on a massive scale. The boom in commodity prices has resulted in energy companies making more money, spending more money and allowing vested shareholders to cash out. Excess liquidity brought about by the strong financial performance of Calgary energy companies was likely a major contributor to the Calgary house price boom. This is a follow-up to my previous post about volatility in the housing market. For those that are looking to buy or sell a house, you may want to research what the worst and best annual scenario may look like. Inflationary effects like rising household income and rent increases will continue and house prices will continue to have softness as long as there is high inventory. 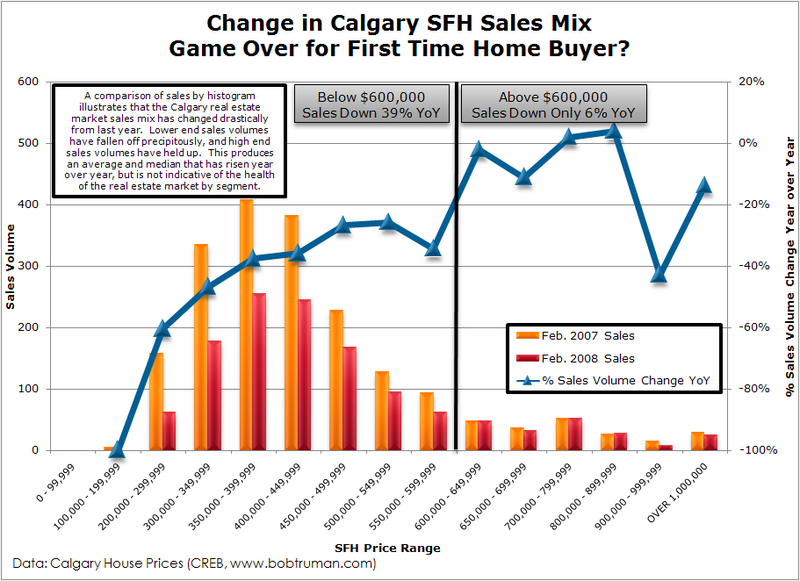 I believe this will entail a soft landing for the Calgary real estate market with the market chugging along between P90 and P50 for between 2-7 years. 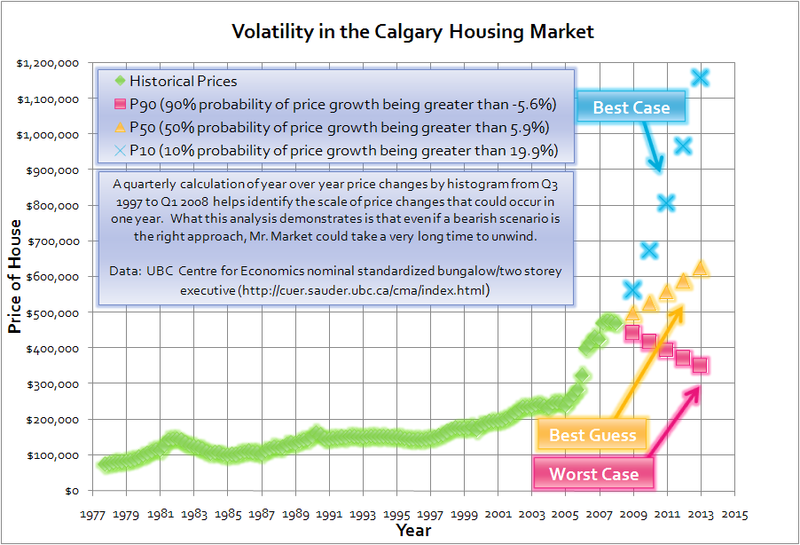 Posted by DustinRJay in Calgary real estate, volatility. 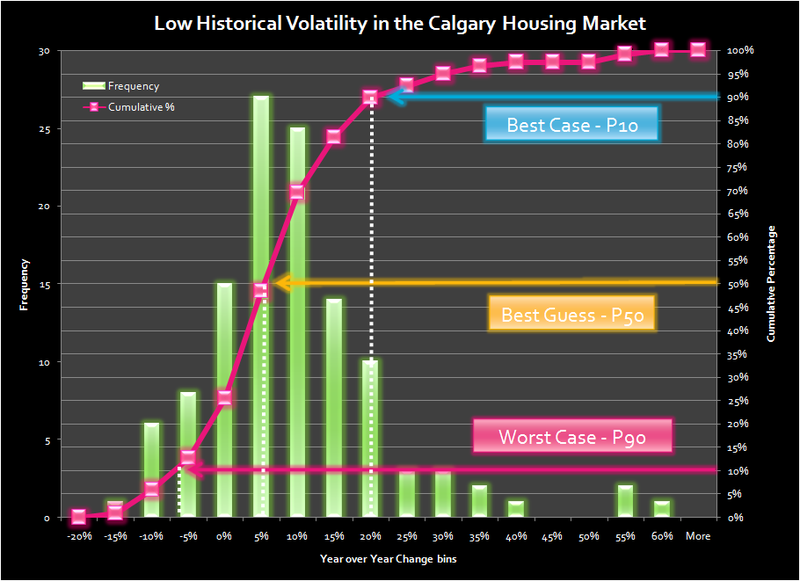 In general, housing prices have a low volatility compared to other asset classes. This is due to the underlying fundamental value (rents) being a relatively stable cash flow. This compares against stocks which have larger variance in earnings and therefore larger volatility in price. 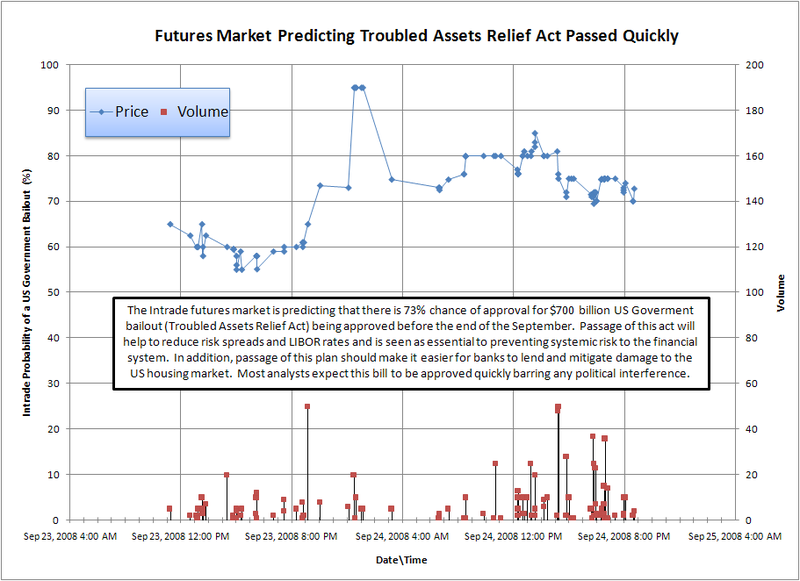 A lookback at historical real estate volatility can help to give a forecast probability cloud. By comparison, the S&P 500 has a VIX index which is representative of S&P 500 volatility over the next 30 day period and is referred to by some as the fear index. Furthermore, the probability of an event occurring that is above the P10 or below the P90 for 5 consecutive years is 1 in 100,000 for each (i.e. : (1/10)^5 = 1/100,000). The shortfall of this kind of approach to volatility is that this calculation is not statistically independent as bear and bull markets typically last between 2-10 years. What this analysis demonstrates is that even if a bearish scenario is the right approach, Mr. Market could take a very long time to unwind. The following graph illustrates what 5 consecutive P10, P50 and P90 events would look like and is meant to represent the best case, best guess and worst case respectively. 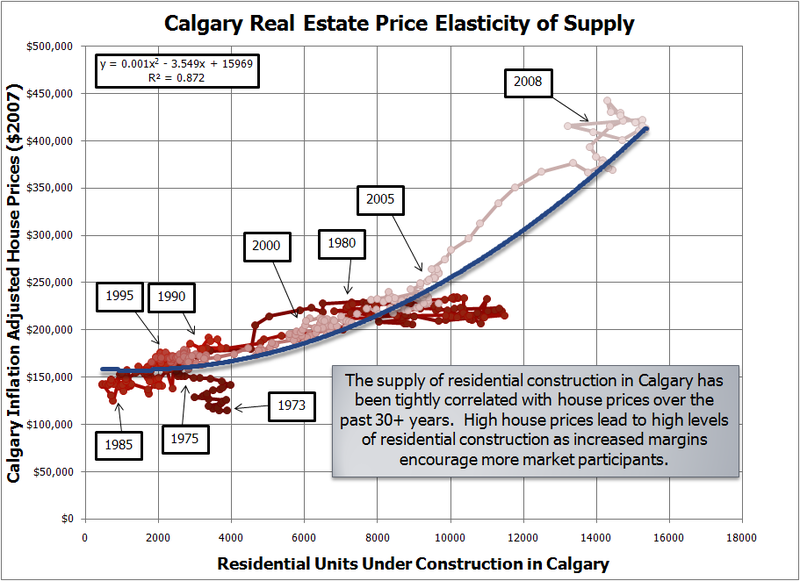 Posted by DustinRJay in Calgary real estate, market behaviour. The failure in the US housing market was not a black swan as some have described it, but an error in understanding and managing collective risks. And on that note, I’ll leave you with a YouTube video of last weeks bank run on Indymac as a demonstration of crowd psychology. Enjoy! Posted by DustinRJay in Calgary real estate, condos. ArriVa is one of the most recent condo’s that have finished construction in downtown Calgary. Construction has finished a couple of months ago and there are currently 22 units in the building that have been listed by speculators for a total of $15 million as shown by the picture below. A review of other condo’s in the downtown Calgary region shows that there is similar amounts of speculative activity with many individuals having no interest in holding the property long term. Calgary condo inventory has hit all-time record amounts and there are currently 2519 condo units for sale in Calgary. In addition, condo inventory is rapidly growing due to near record amounts of multi-family home construction in Calgary. With Calgary condo inventory roughly triple last year, sales down 37% year over year for February, and listings up 40% year over year for February, I find it likely that many of these speculators will be unsuccessful with flipping there property and some will end up in foreclosure. 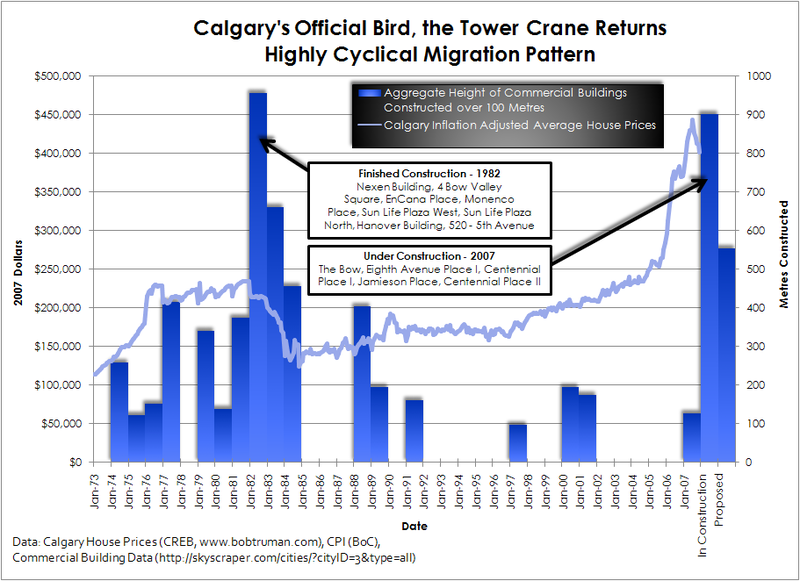 The amount of commercial real estate being developed in Calgary has not been witnessed since the 70’s and early 80’s. There are currently several mega-projects being built including the Bow (236.0 m), Eighth Avenue Place I (213.2 m), Centennial Place I (176.0 m), Jamieson Place (170.0 m), and Centennial Place II (110.0 m). These commercial buildings will greatly increase the amount of square footage of commercial real estate available downtown. The Bow, at a staggering 1.7 million square feet, will consolidate EnCana’s staff from three buildings into one. Eighth Avenue Place (Penny Lane) currently has no anchor tenant and is being built on speculation. Commercial real estate lease agents are currently having a hard time getting anyone to sign a 1+ year contract due to the volumes of commercial real estate being developed. 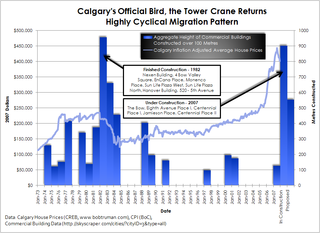 It is possible that there is going to be an oversupply of commercial real estate in Calgary, and after this wave of commercial real estate is finished, there will likely be an extended lull in construction. 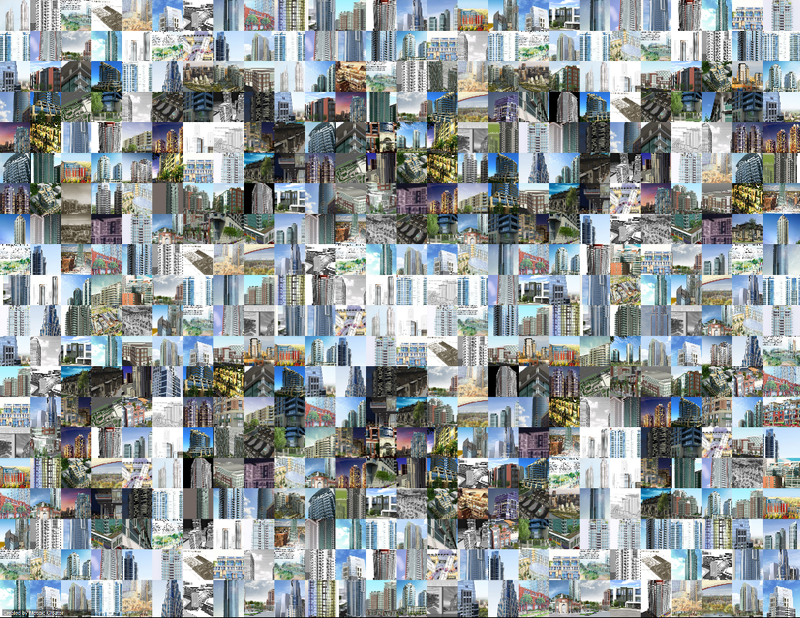 A timeline of images of Calgary skylines shows that there is little change in commercial development from 1985 to 2004. Residential prices boom during periods of commercial construction booms. Current commercial construction levels have not been this high since the 70’s and early 80’s. 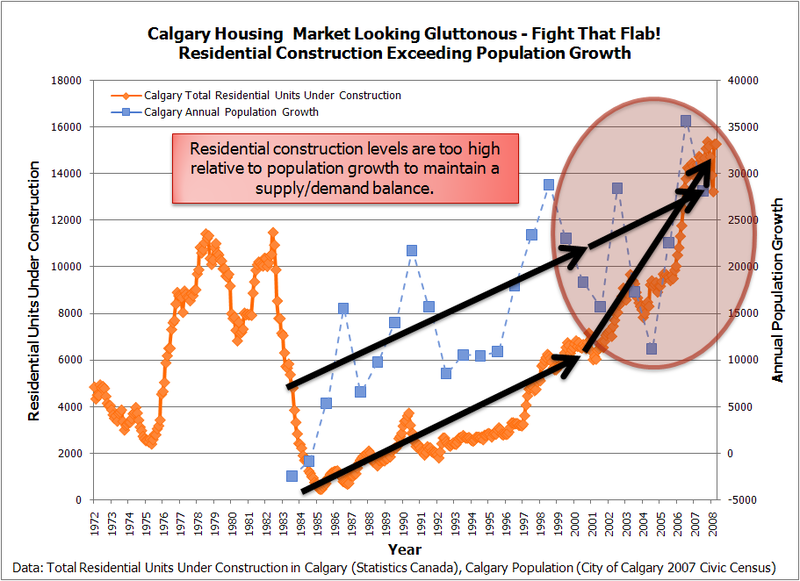 The residential real estate bust in Calgary occurred during a time when there was record levels of large scale commercial real estate construction being completed. When the 1980’s commercial construction boom ended, house values fell dramatically. Overdevelopment of commercial real estate in the 80’s left little constructed for the following 20 years. Commercial real estate construction is incredibly cyclical. For this construction boom, there is a much greater share of construction projects over 100 metres that are residential vs. commercial. As an aside, I encourage anyone who is looking at the Canadian real estate market to look past the sound bites. Due to their vested interest, it is difficult to find a banker, real estate agent, CMHC analyst, developer, newspaper, or radio program which has the chance to be frank and analytical.